That is why we thought we’d single out a few houses located right here in good old South Africa which flaunt some exceptional designs. Whether it’s a family farm in the Free State, a beach house in Cape Town, or a suburban house in Johannesburg, our range of favourites are sure to inspire and amaze you. 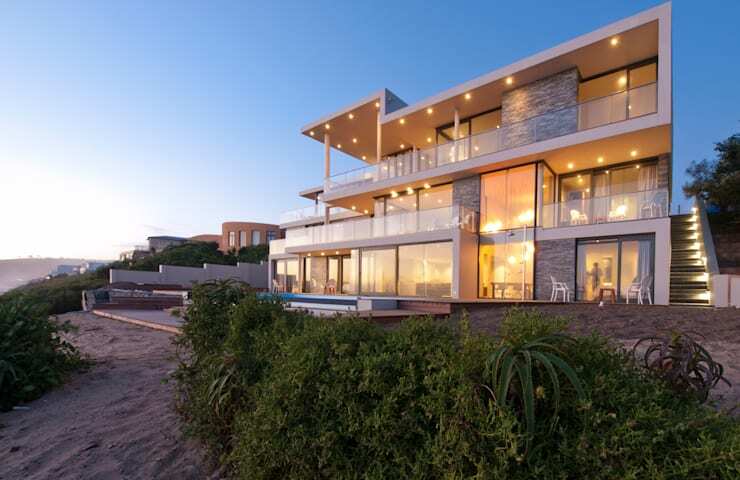 So, let’s take a look at 9 of the most beautiful houses (in our opinion, at least) that are just as much part of South Africa as biltong and braaivleis! We kick off our list with a stunner that features on a lot of lists showcasing large and/or stunning architectural pieces – and with good reason. This creation flaunts a most majestic presence, a striking vision, and a dark charcoal-toned coating that demands attention. Besides, how many houses can boast about having their own glass-walled koi pond? Our next number treats us to a stunning sea view, yet it is not the ocean that captured our hearts in this image. 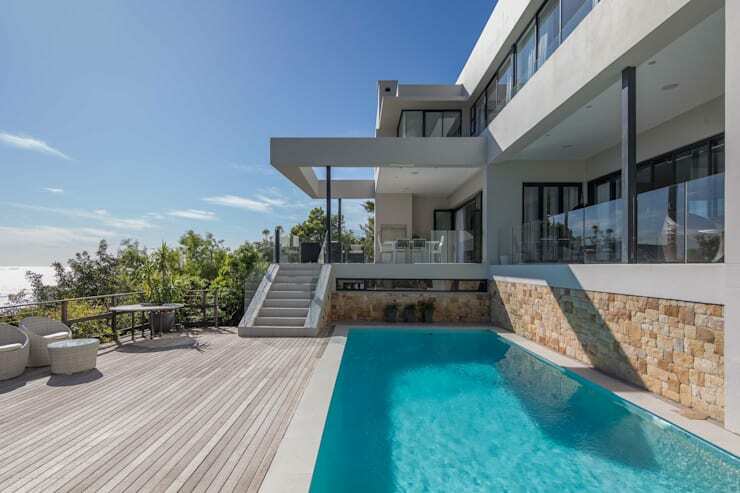 This modern house enjoys a delicious combination of striking materials (wooden deck, stone-clad walls, glass balustrades), as well as clean and open spaces, which ensured itself a spot on our list! 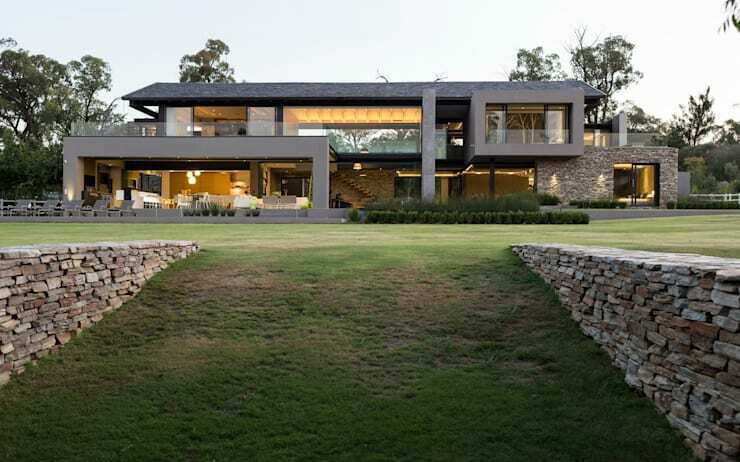 We just adore how this house opens up to the exteriors, with spacious terraces and striking decks linking up the interiors and the spacious landscape with each other. In addition, it is clear that this house knows not to neglect its exterior sides, for they flaunt just as much beauty and functionality as the interiors. 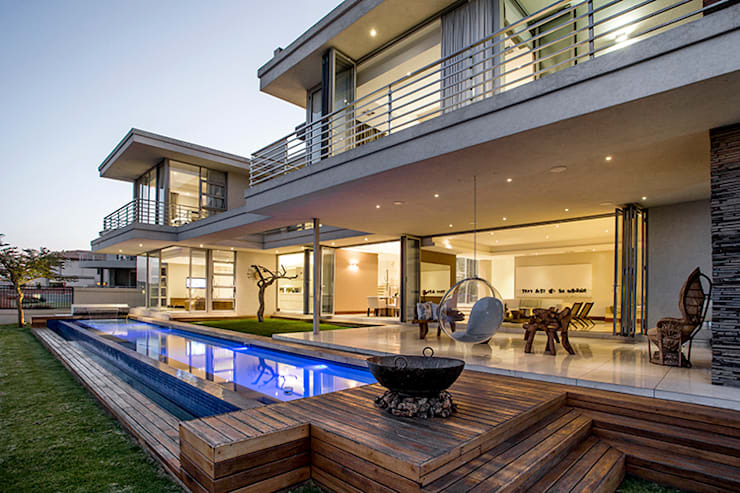 We love how this modern house’s left side mimics the golden age of Cape Dutch architecture. That old-fashioned touch stands out so prominently amongst the rest of the contemporary features, yet doesn’t result in a confusing look at all. Plus, how could anybody ignore a house which flaunts such spacious balconies that allow you to take in the view? 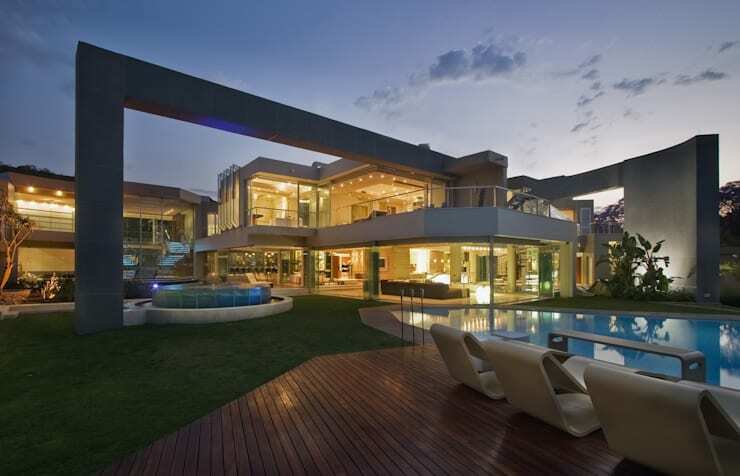 Speaking of spacious balconies, this house definitely brings its ‘A game’ when it comes to enjoying the view. In addition, it presents an elongated layout that seems even bigger and more spacious thanks to those light neutrals adorning the façade. And oh, did we mention there is also a fabulous swimming pool in addition to the spacious balconies and terraces? This creation is truly something unique. Flaunting a range of both modern and rustic touches, it also helps itself to a decent helping of lush plants, which beautifully surround the house and rank upwards select surfaces, even going so far as to cover certain areas completely. We’ll take a house with such fresh touches any day of the week! This 750 m² creation definitely creates a dignified first impression. Is it because of its elongated layout? Its emphasis on outdoor living and entertaining? Or is it the decadent range of building materials and styles that all intertwine to form an exceptional-looking façade? You decide! Meulen Architects have done it yet again. And no, this is not a five-star hotel, it’s somebody’s house! Flaunting an ultra sleek look via its fabulous range of cutting-edge surfaces and materials, this structure is not shy about showing off its size or style (after all, it does feature a basement parking big enough to hold 14 cars). In addition, it ensures a lavish back yard where the crème de la crème of house parties and up-class socialising surely take place on a regular basis. 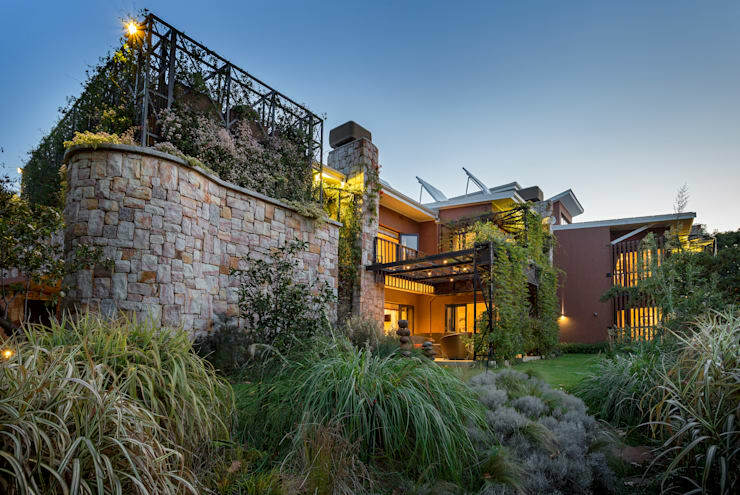 We close off with a showing that takes up a beautiful space in the Eastern Cape, yet was designed by European architects. This beach house is all about welcoming in the view, as those expansive windows and glass doors have no choice but to let in a rich amount of light and sea views. Although it presents a fabulous size, this house’s layout is quite straightforward to comply with the requirements of the modern architectural style – what you see is what you get. And what we see is a whole lot of style and elegance! Want to discover more about this fantastic house? 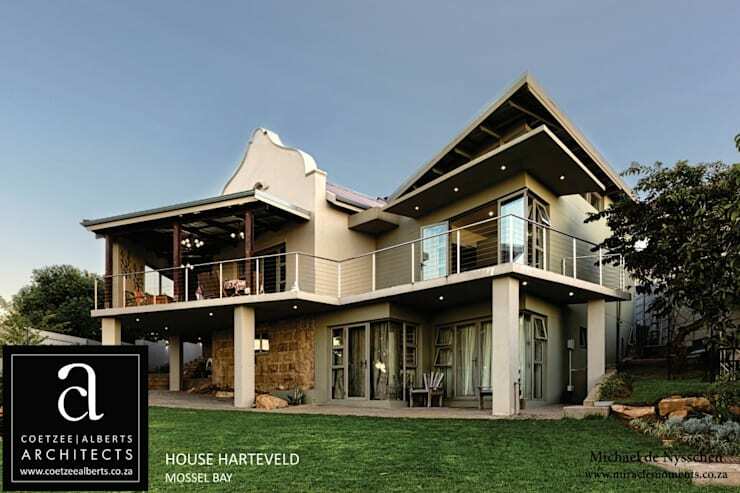 Of course you do, so check out: An Eastern Cape Home with Champagne Views. 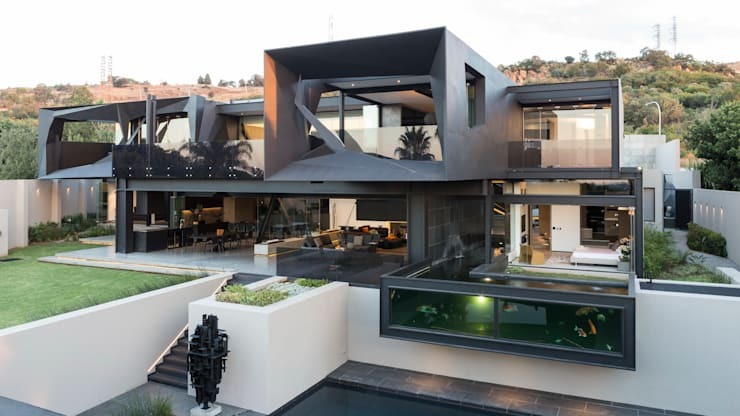 Are these really some of the most striking houses in South Africa, or do you disagree with our choices?